I welcome your questions and honor your individual needs and concerns, as we aim for you to have a healthful and profoundly positive birth experience. I see pregnancy and birth as sacred and miraculous—a rite of passage into motherhood, a powerful experience that enhances personal growth, inner strength, and deepens family closeness. I view birth as a normal part of family life, and we have confidence in a woman’s ability to grow and birth her baby. I honor a woman’s inner wisdom about her body and desire to labor and birth in her own unique way. At home women and their families can truly benefit from the ancient art and sound traditions of genuine midwifery care, that has proven it’s worth around the world and throughout history. My interest in the field of childbirth began in 1992. After the birth of my son, Dillon, in a typical interventive hospital setting, I enrolled with the Association of Labor Assistants and childbirth Educators (ALACE) to become a Certified child birth Educator. I continued my education to become a Certified Labor Assistant. I enrolled with the Association of Labor Assistants and child birth Educators (ALACE) to become a Certified child birth Educator. I continued my education to become a Certified Labor Assistant. In the midst of this I gave birth to my second son, Cole – also in a hospital setting, though his birth was very different than that of his brother’s. Through consumer-based child birth classes I was much more informed about my choices and had a very positive experience with the help of a trained doula who assisted my husband and me through an empowering pregnancy and birth. After Cole’s birth, I began attending births as a labor assistant, in both home and hospital settings. In 1994 I also completed certification with the International Childbirth Education Association (ICEA). A thriving practice in South Carolina kept me very busy teaching classes, attending births as a doula, writing for local and international publications and volunteering at the Charleston Center for Women. It was during this time that I began my studies toward becoming a midwife. In 1998 my daughter, Skylar, was born at home with the assistance of a midwife and a wonderful doula who helped welcome our daughter into our arms along with other friends and family. It was during my pregnancy with Skylar that I began my training in midwifery as a Licensed Midwifery Apprentice as well as enrolling in a midwifery acedemic program through Apprentice Acedemics. We relocated to New Jersey in 1999 where both my husband and I had grown up. 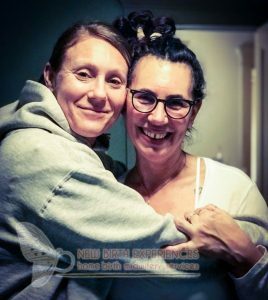 I began an apprenticeship with a home birth midwifery group in addition to my beginning academic studies through the National College of Midwifery. In January 2005 I completed my program and graduated with an Associate of Science in Midwifery degree. In addition to becoming a Certified Professional Midwife (CPM) through the North American Registry of Midwives (NARM), I am a Licensed Midwife in the state of New Jersey. Currently, I am welcoming babies into the world throughout the wonderful state of New Jersey as well as volunteering on the, New Jersey State Midwifery Liasion Committee. I have also become a preceptor for the National College of Midwifery and am currently a preceptor for students who wish to become Certified Professional Midwives, such as myself. 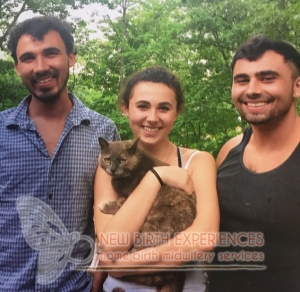 My journey into midwifery didn’t start with my enrollment into NCM, but started at a young age watching my own mother giving birth at home to my siblings. Days shy of turning 3, I can remember my mom giving birth to my younger sister. The memory of her in deep labor, moaning and swaying to the dance of labor. The Midwives arriving, surrounding her with support and love. And finally watching my sister come into this world. It was such a sacred event. and she instilled in me at a young age that birth was a natural, normal life event. That moment in my life made a huge impact on my own belief in birth. It imprinted in me to trust our bodies, and to believe in our bodies ability to birth. Having had this privilege of witnessing birth in such a natural and normal way, I chose to birth my own 3 children at home attended by midwives. The birth of my children was truly the most empowering and life changing, it left me craving to be part of the birth world. That craving and passion for birth had me reading everything and anything birth related I could get my hands on. I also started offering my assistance to friends and family as a labor assistant/doula. I have been attending births since 2009 and became a Licensed Certified Professional Midwife in 2016. Each birth being it’s own unique event, imprinting me with the strength and rawness of strong mommas, birthing their babies into this world with strength, love and determination. I look forward to continuing on this path with the knowledge and guidance of my Preceptor, Dina Aurichio, and am honored to be part of your birth.